Inmates and staff at a a number of U.S. prisons have gotten sick recently, apparently due to exposure to illegal drugs. More than two dozen workers at Pennsylvania prisons became ill, prompting a lockdown of all the state’s prisons. Ohio authorities say a mixture of heroin and fentanyl likely caused one inmate to overdose in a prison there. More than two dozen staff also received medical treatment. 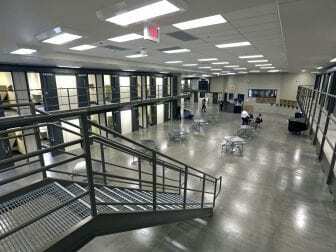 And in Pennsylvania, authorities took the unusual step of locking down every prison in the state after 29 prison workers were sickened in recent weeks. The state’s secretary for Drug and Alcohol Programs, Jennifer Smith, says it’s often not clear which drugs are causing problems. JENNIFER SMITH: We really don’t know what substances are out there. Things are being mixed together. Things are being made. We don’t know what these substances are. CHANG: While there’s no apparent links between these recent incidents, NPR’s Jeff Brady reports it is clear that more potent and deadly drugs from the outside are making their way inside. JIM DEPRIEST: We don’t have the actual medical examiner’s results on these five deaths, so I’m speculating that these deaths might have been related to the ingestion of illicit drugs. DEPRIEST: We’re warning them that this is not something where, if something goes wrong, you get sick or have a hangover or whatever. This stuff can kill you. AMY WORDEN: You have corrections officers who have had to handle an inmate or their property. We’ve also found that mailroom employees have been sickened. We’ve seen nurses being sickened. They obviously have direct contact with our inmates – and also a librarian. AMY WORDEN: And also know how to properly don them so that you’re not, you know, touching your face or you’re not contaminating somebody else or something else or yourself just in the course of putting on your equipment.